So Kickoff went smoothly today. Unfortunately there was a problem with NASA TV, and we missed the live view of the game, but we went to Youtube and saw the game and we got the Game Manuel from the FIRST Website. We are all really excited for this years game. We have started brainstorming and will be brainstorming throughout the rest of today and tomorrow. It was a great kickoff. After the game was released we split for a break. Some of us played video games and others sat and talked for a little while. We are having fun. Can’t wait to see many of you at regional. Have fun and GO FIRST! Welcome to River Rage 16. Follow the action here throughout the day. 10/27 3:56 PM: We received a participation award. It was a great team effort overall. Thank you for following along with us today. Photos will be posted soon. Don’t forget to follow us Twitter (@FRCTeam501). See you next year! 10/27 2:52 PM: It was a hard fought match, but our alliance lost 69-65. Both alliances balanced on the bridges and we scored several baskets. We are done for the day. Thank you to Team 131 and Team 138. Stay tuned for awards. 10/27 2:35 PM: Our alliance won the last match 70-31. We were able to score in autonomous mode and balance with another robot. It was a great effort all around. Our next match is coming up. We will b on the red alliance. If we win, we move on. Stay tuned! 10/27 2:21 PM: Our next match is coming up. We are on the red alliance. If we win, we move on. Stay tuned! 10/27 1:52 PM: We lost our second elimination match 69-37, but we’re not done yet, as we have entered the losers bracket. Stay tuned. 10/27 1:40 PM: Our second elimination match is next. We will be on the blue alliance. If we win, we will move to the quarterfinals. Stay tuned. 10/27 1:20 PM: Our alliance won our first elimination match 41-36. We were able to balance with team 138, leading our alliance to victory. Stay tuned for more updates. 10/27 1:10 PM: Our first elimination match is next. We will be on the red alliance. Stay tuned. Here is a picture of our mentor Isaac in a costume. 10/27 12:47 PM: We will be in elimination match 2 on the blue alliance. Stay tuned. 10/27 12:33 PM: During the elimination matches, we will be in an alliance with Team 131 (CHAOS) and Team 138 (Entropy). Stay tuned. Elimination matches begin at 1:00. 10/27 12:15 PM: Qualification matches are over. We rank 7th with a 3-2 record, thanks to our coopertition points we gained from balancing on the center bridge. Alliance selections are going on now. Stay tuned! 10/27 10:23 AM: Our alliance lost the last match 35-13, but our robot balanced on the coopertition bridge with another robot from Team 131 (Central High School’s Team Chaos)! Our next match is Match 22 and we will be on the blue alliance. Stay tuned! 10/27 9:50 AM: Our alliance lost the last match 35-26, but our robot balanced on the bridge and our alliance performed well overall. Our next match is Match 13 and we will be on the red alliance. We are 1-1 and ranked 18th out of 33. Stay tuned! 10/27 9:37 AM: Our alliance won our first match. Our robot successfully balanced on the bridge with another robot, capping an overall successful match. We are in Match 8, which is next. We will be on the red alliance. Stay tuned. 10/27 9:28 AM: Our first match is Match 6. We are on the field now. Stay tuned. 10/27 7:10 AM: Welcome to River Rage 16. Preparations for the day have begun. Matches begin at approximately 9:00 AM. See you then! The 2012-2013 school has kicked off and so has Team 501! We held a recruitment meeting on September 20th and we will be holding our first official meeting this coming Thursday. This is going to be an exciting year for our team. 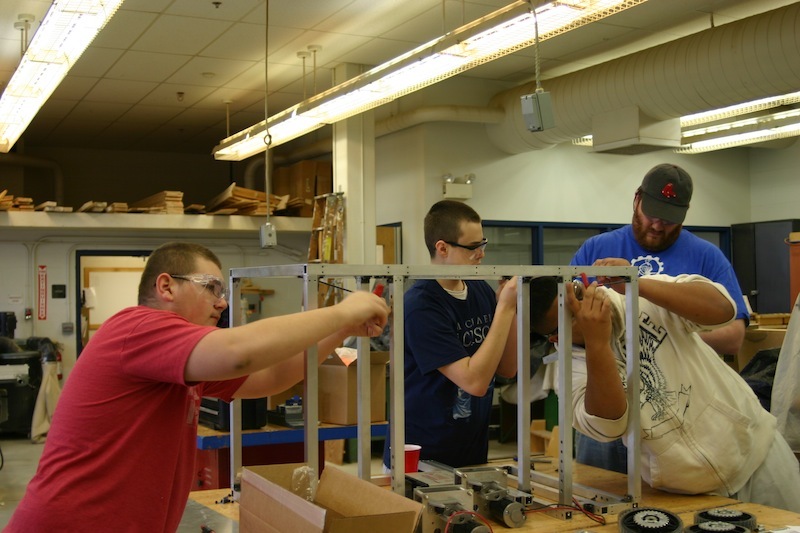 While build season is still a few months away, our team has numerous things to do before it begins. Our website committee has already been hard at work analyzing what needs to be done for this year’s website. Several members of our team attended Goffstown High School’s Open House with last year’s robot as we try to interest new students. We also planning several exciting fundraising opportunities. Finally, we are preparing for Rier Rage, a local offseason competition coming up in a few weeks. For more information about River Rage, click here. It’s going to be a great year! Despite the 2012 competition season coming to an end, students on Team 501 know that an FRC season never really ends. We have planned to attend several upcoming local competitions. This year, our team plans to attend the 13th annual BattleCry Robotics Competition at WPI (Worcester Polytechnic Institute). The event will take place on May 18-19, 2012 and it will be the first time that our team has participated in this particular offseason event. BattleCry aims to create as close to a real FRC experience as possible, including lights, sounds, and a full arena-like atmosphere. BattleCry features 48 teams, mostly from the New England area. To find out more about BattleCry, click here. In early June, our team will once again attend Mayhem in Merrimack at Merrimack High School in Merrimack, New Hampshire. This will be the 5th year our Team has attended this event. Unlike BattleCry, Mayhem in Merrimack is a smaller, more casual offseason event. Our team uses the event as an opportunity to meet new teams, get new ideas, and to allow anyone on our team the opportunity to drive our 2012 robot. Mayhem in Merrimack is always a great time for our team and our members are really looking forward to it. Mayhem in Merrimack consists of up to 24 teams and will take place on June 2nd, 2012. For more information about Mayhem in Merrimack, click here. In addition to offseason competitions, our team continues to update our website in preparation for its competition at the 2012 FRC Championship in St. Louis. Finally, we have planned two team parties to take place over the summer, as well as thinking about summer fundraising options. We had a great competition season this year and we are looking forward to the future. After two days of fierce Robotics Matches, Team 501 had made it into the Semi-Finals! We lasted for a few matches, but were ultimately knocked out. The Drive Team put up a very good fight despite the bugs still present in the robot. Our driver, Nicole Lyle, balanced on the ramp with near 100% consistency! At the end of Day 1, Team 501’s very own Web Committee, headed by the man himself, Dale Keith, won the 2012 Website Award for the BAE Systems Granite State Regional! At the end of Day 2, when the final matches were finished, Team 501 was called down for the Judge’s Award! We are still busy though, as we get ready to rock the Washington D.C. Regional! Our shooter needs a small modification, and our Software Development Team will have a custom dashboard finished! More on that when it comes out. All in all, Team 501 has overcome amazing hurdles to come out (almost) on top! See you all in D.C! March 3 8:41 PM: Team 501 is glad to accept the 2012 Granite State regional Judges Award! Thank you for following along with us this weekend. We hope to see you next year and don’t forget to follow along with us in three weeks at the Washington DC regional! Go Team 501! March 3 4:04 PM: Congrats to Team 131 CHAOS (from Manchester NH) and their alliance partners for winning the 2012 BAE Granite State Regional. The award ceremony is now going on. Please stay tuned! March 3 2:48 PM: Semi final 2 Match 2 Result Red Alliance Wins: 43-33. We got off to a good start in hybrid mode, with our alliance scoring several points. Our alliance was very consistent in scoring during this round and this round came down to the wire. The round was decided through the balancing of the bridges. Our robot balanced on our alliance bridge, but the red alliance.had two robots balance on their bridge, giving them the win. Congrats to our alliance partners: Team 319 and Team 126 for a great run. Please stick around to see the winners of the finals and today’s award ceremony. March 3 2:26 PM: Semi final 2 Match 1 Result Red Alliance Wins: 56-22. We got off to a good start in hybrid mode, with our alliance scoring 18 points. However, we were overmatched by the scoring of the blue alliance afterward. The red alliance was also able to balance on the bridge. We now must win our next match to stay alive. Semi finals 2 Match 2 is up next. We will be on the blue alliance. Stay tuned! March 3 2:22 PM: Semi final 2 Match 1 is up next. We will be on the blue alliance. Stay tuned! Our alliance was very effective in shooting the ball in this match and combined with our robot balancing on the bridge, our alliance won the match and moves to the semi-finals. Stay tuned! March 3 1:51 PM: Quarter final 4 Match 2 is up next (if we win we move on). We will be on the red alliance. Stay tuned! March 3 1:39 PM: Red Alliance Wins 21-10! Our robot fired a ball in autonomous mode and we had a very strong alliance that led us to victory! March 3 1:31 PM: Quarter final 4 Match 1 is up next (our first quarter final match). We will be on the red alliance. Stay tuned! March 3 12:11 PM: We were selected to an alliance! We are paired with the number three seeded team. Thank you to team 126 and team 319 for selecting us as your alliance partner. We will be on the red alliance. Good luck to all teams! Stay tuned! March 3 11:00 AM: Match 78 Result Blue Alliance Wins: 36-21 . What an exciting match! Our robot scored a basket in hybrid mode. After that, the match was all about balancing on the bridges. Two robots from the blue alliance balanced on their bridge and our robot balance on our bridge. One robot from each alliance balanced on the coopertition bridge, earning everybody coopertition points! Great display of teamwork from both alliances! With match 78 being our last qualification match, elimination matches are now coming up. We must be selected to an alliance by one of the top-seeded teams in order to continue competing. Please stay tuned! March 3 10:45 AM: Match 78 is up next. This is our last qualification match before elimination rounds. We will be on the red alliance. Stay tuned! March 3 10:15 AM: Welcome back to the regional. Our robot is doing a lot better today. In our first two matches of the day we won (Match 66 30-23) and tied (Match 71 13-13). in our second match, we were responsible for scoring all 13 points on our alliance, including balancing on the bridge! We have also been able to score baskets in hybrid mode today. Our last qualification match of the competition is match 78. We will be on the red alliance. Stay tuned! 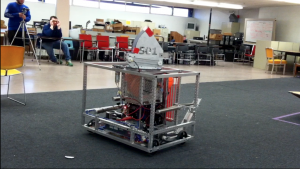 March 2 10:39 PM: Here is a photo of our robot on the field from today. March 2 4:29 PM: Our next match will not occur until tomorrow. We finished today at 1-6. We gave a great effort today and we’ll be back at it tomorrow. Please stay tuned for the awards ceremony, which will take place later today. March 2 4:02 PM: Match 53 Result Red Alliance Wins: 15-6 . Match 53 was filled with bridge balancing and hybrid shooting. There were several baskets scored in hybrid mode, which gave us an early lead. However, the red alliance came back with several baskets of their own. Our robot had successfully balanced on the bridge, when another robot from our alliance tried to balance as well. Unfortunately, they were unsuccessful at the last second, which was okay, as we showed tremendous coopertition and gracious professionalism in the match. And after all, those are the core values of FIRST. Our next match is Match 66. We will be on the blue alliance. Stay tuned! March 2 3:26 PM: Match 47 Result Red Alliance Wins: 30-6 . Our robot is still performing well, but the red alliance clearly outdid the blue alliance in this match. However, one robot from each alliance balanced on the coopertition bridge, which heavily benefitted both teams. Great Job by both alliances in that match. Our next match is Match 53. We will be on the blue alliance. Team 501 would like to extend a shout out to Team 4403, who traveled to Manchester from Torrean, CU, Mexico. Great rookie season so far, Team 4403. Stay tuned! March 2 3:13 PM: Match 47 is coming up next. We will be on the blue alliance. Stay tuned! March 2 2:35 PM: Great job by local NH Team 131 (Manchester Central High School) CHAOS in that last match! March 2 1:28 PM: Match 35 Result Red Alliance Wins: 29-23 . In perhaps the most exciting match of the day, we performed very well. Our robot nailed a 3-point shot in hybrid/autonomous mode and then followed it up with three more single point shots later in the match. To top it all off, our robot was one second away from balancing on the coopertition bridge with another robot. Things are definitely looking up. Our next match is Match 47. We will be on the blue alliance. Stay tuned! March 2 1:28 PM: Match 27 Result Blue Alliance Wins: 16-10 . We had a strong alliance during this match, but the blue alliance balanced on the bridge near the end of the match to put them over the top. We are shooting better though. We will be on the blue alliance for our next match, which will be Match 35. March 2 12:19 PM: Match 22 Result Blue Alliance Wins: 17-4. . Our robot did better in this round, as we downed a basket for 3 points! We still have not balanced on the bridge, but there’s still plenty of time. Match 27 is up next. We will be on the red alliance. March 2 11:56 AM: Match 22 is up next. We are on the red alliance. March 2 10:50 AM: Match 11 Result Blue Alliance Wins: 35-2. Our alliance lost this match, but it wasn’t without a bright spot. As the match was ending, our human player, Isaiah Cote, threw a ball from his station and it went in for two points. Nice job Isaiah! Our next match will be Match 22. We will be on the red alliance. March 2 10:40 AM: Match 11 is up next. We are on the red alliance. March 2 10:09 AM: Red Alliance Wins 37-3! Our robot did not score any any baskets due to a ball being stuck inside of it. However, our alliance was very strong and we won the match 37-3. Our hoop hats were also noticed by the announcer. Our next match is Match 11. We will be on the red alliance. March 2 9:50 AM: Members of our team were featured in the Union leader today. Click here to read the article. We are currently in Match 4. March 2 9:22 AM: the opening ceremonies have ended. Match 1 is about to begin! Our first match is number six. We will be on the red alliance. March 2 8:05 AM: Welcome to the 2012 BAE Granite State Regional! Opening ceremonies start at 8:30 AM. We hope you’ll join us then. February 29 9:00 am: Welcome to our live blog for the 2012 Granite State Regional! Although the regional begins on Thursday, March 1st, the live blog will not start until Friday, March 2nd, as Thursday is a practice day. We hope you’ll join us then. As the 2012 build season came to a close, our team reached several milestones and finished strong. 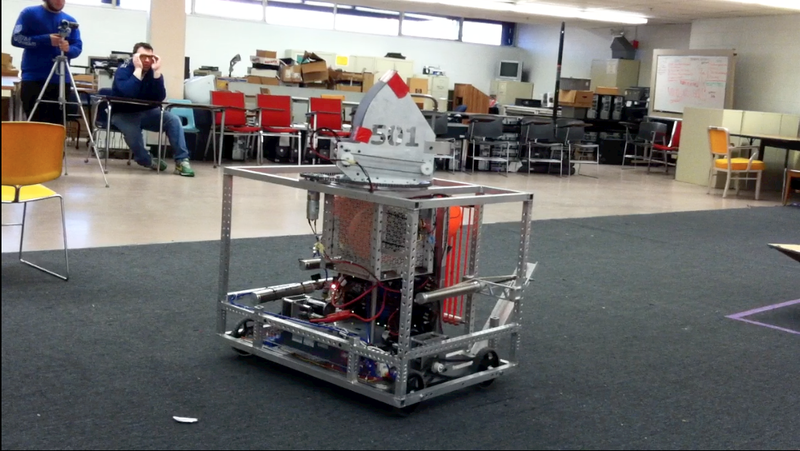 Last Saturday,our team had our 2012 robot driving on our test carpet. This allowed the drive team to practice with the robot and also gave us a chance to discover any problems. Our team spent Sunday, Monday, and part of Tuesday refining and perfecting the robot and the software that runs on it. Over the next several days leading up to the Granite State Regional, our team plans to produce spirit items, practice driving with our test robot, work on robot software, and test the software on our test robot. Our team also plans to refine the 2012 robot shooting mechanism (which we removed before bagging the robot). The shooting mechanism will be attached to our test robot for use during this week and then be reattached to our current robot on the practice day (Thursday) of the Granite State Regional. 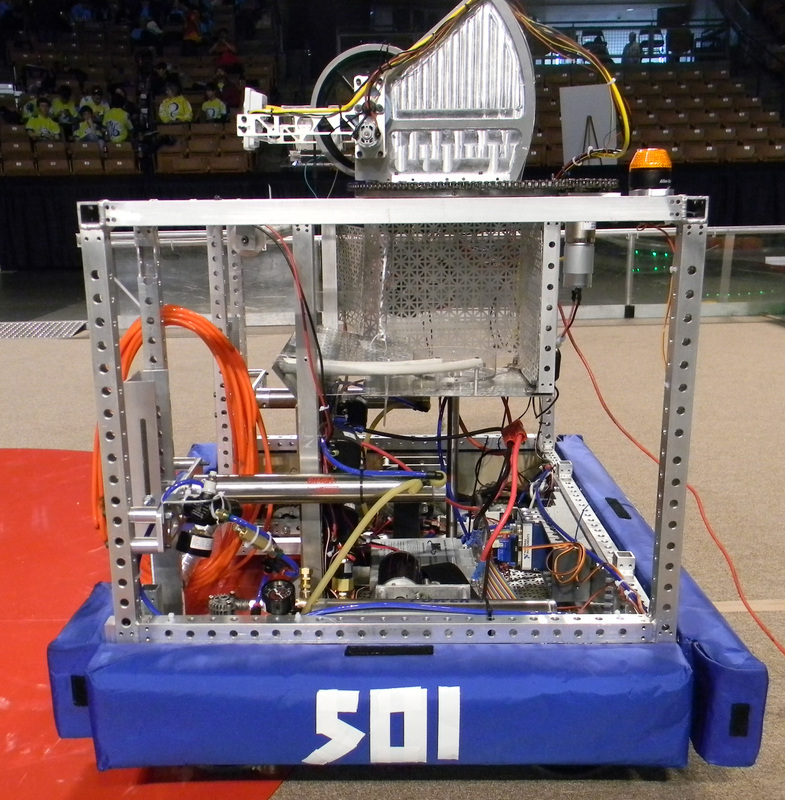 Our 2012 Robot - "Hot Shot"
Speaking of the Granite State Regional, we have a downloadable invitation for all visitors available here. If you or someone you know can’t make it to the regional but still wants to follow the action, you can follow our live blog (which we will be conducting for the second year in a row) throughout the day on Friday, March 2nd and Saturday, March 3rd. To access the live blog starting Wednesday February 29th, just go to our home page and click on the link. We hope you’ll join us then. Good luck to all teams during the competitions. A video is posted below showing a taste of our 2012 robot. Enjoy and we look forward to seeing everyone at the competitions. Only 4 days until Granite State Regional! 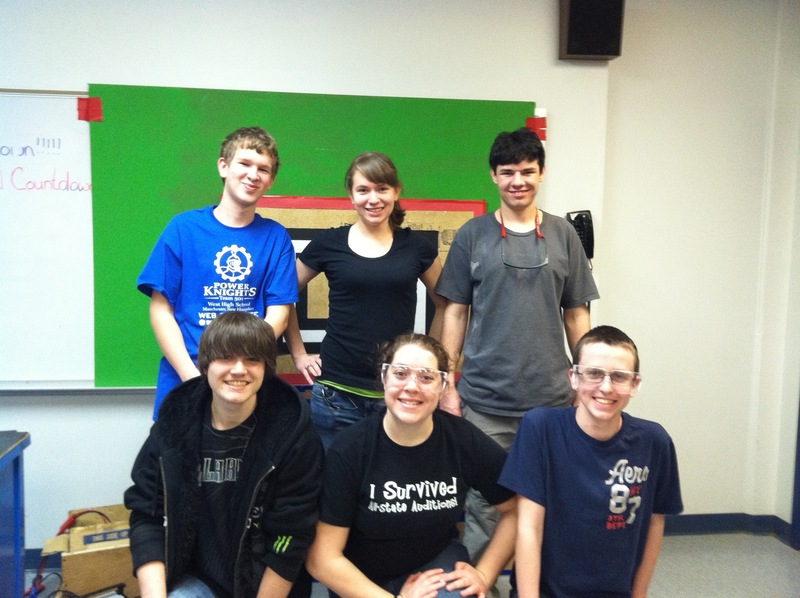 On Friday night, Team 501 held tryouts for the 2012 robot drive team. A carpet was laid on the floor to simulate a surface that is similar to the actual FIRST field. The carpet featured a “penalty zone” and several objects that the students had to lightly come in contact with. This helped drivers learn accuracy and helped simulate objects on the competition field. Students were give three practice laps to get used to the field. After the three practice laps we’re completed, a “quiet lap” took place where students were timed on how long it took them to get around the field. Going inside of the penalty zone resulted in deductions during the quiet lap. Once the quiet lap was completed, a “loud lap” was conducted. This was performed to simulate the crowd and noise levels during a match at an actual FIRST competition. The loud lap was important for potential drivers to experience what it is like to actually drive the robot during a competitive match. Our 2012 robot drive team consists of the following people: Nicole Lyle (GHS Junior), Sam Lewin (GHS Sophomore), and Isaiah Cote (WHS Senior). Nicole will serve as the driver, Sam as the operator, and Isaiah as the human player. In case of emergency, we also selected a backup drive team. The backup drive team will consist of Connor McLellan (GHS Junior), Erin Morrison (WHS Senior), and Jacob Tilton (WHS Freshman). Connor will serve as the backup driver, Erin as the backup operator, and Jacob as the backup human player. You can learn more about our drive team by going to our Current Team Members page. Everyone who tried out for the drive team did a great job and put in a great effort! With ship date only days away, the drive team better start practicing! 3 days until ship date! As build season winds down, Team 501 is hard at work completing our robot. Over the last two weeks, the main chassis continued to make great progress as well as the test robot. During Week 3, basic driving tryouts were held using our test robot. Students were challenged to navigate our test robot around an obstacle course. The video is available on our Photos and Videos Page This was an important preliminary test for the full Drive Team tryouts coming up towards the end of week 5. The software team continued to implement a custom GUI (Graphical User Interface) for this year’s driver station computer. This will help provide a clear indication of what is going on with the robot while on the field. Ship date is coming up!